TENERIFE (FIBA Women's Basketball World Cup 2018) - FIBA Africa President Hamane Niang has urged African countries to build on Nigeria's and Senegal's performances at FIBA Women's Basketball World Cup 2018 in Tenerife, Spain. Although both Senegal and Nigeria opened their campaigns in Tenerife on the losing side - with defeats to eventual finalists USA and Australia respectively - the Africans came up stronger on Day 2, with the Senegalese beating Latvia and the Nigerians getting the better of Turkey. For the first time in the competition's history, two African nations achieved a milestone by moving out of the Group Phase, and, more importantly, they proved to be the equals of their European and American counterparts. For some, it was a shocking reality seeing high-flying Latvia come up short against Senegal. And, even more surprising, was when Turkey - ranked 10th in the FIBA World Ranking Women, presented by Nike - fell short against Nigeria, a team that had last participated at a World Cup in 2006. Unsurprised, though, was Niang, who witness history being made in Tenerife. "We have to tip our hats off to Nigeria and Senegal for their performances against European teams," Niang said to FIBA.basktball. "It was one of the objectives set out in Africa for our national teams to compete against the Europeans because, other than the USA and Australia, it is these sides from Europe that have been the big threats at past Women's World Cups." 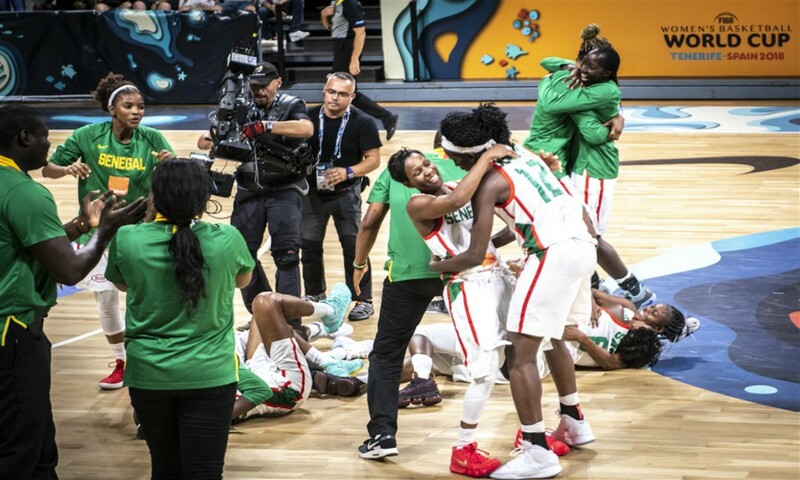 Nigeria went on a three-game winning streak beating Argentina and Greece to become the first African team to reach the FIBA Women's Basketball World Quarter-Finals for much to the delight of fans, basketball fans, and an entire African continent. "For a very long time, African teams came to this competition to limit the damage as used to be said. What has been positive in this competition is that the African teams have played without any anxiety and on an equal footing with their opponents," Niang reflected. While Nigeria finished eighth, Senegal returned home with an encouraging 12th place out of 16, and a lot to look forward in years to come. Niang, who is also FIBA Vice-President, explained why the performances by the two teams is a game-changing moment. "For Nigeria and Senegal to prove themselves to be evenly matched with these teams is a source of great happiness for us. We're convinced that what has happened in Tenerife is historic," he said. "To have one African team in the eight best women's sides and two of them among the top 12 teams in the world is a performance we have to highlight so that future African teams coming to the competition will not do so just for the sake of taking part, but rather to rightfully represent the very best of the African game and continent. "It's historic for women's basketball and the arrival of Africa in what is otherwise a closed circle and selected group has to be saluted. It is worth recognizing the steps forward that Africa has taken. It means that basketball, from a young age, is starting to bear fruit." Both Nigeria and Senegal won the hearts of fans attending games in Tenerife. Niang paid tribute to the Tenerife 2018 organizers. "I think the Spanish fan-base knows, recognizes and appreciates good basketball so I wish to acknowledge the spectators. I also wish to salute the Local Organizing Committee and the Spanish Basketball Federation who have been great."